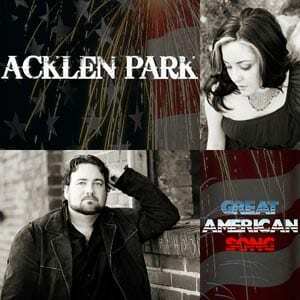 Country duo Acklen Park released their single “Great American Song” to Country Radio on Jan. 26. It is also available for purchase and download on iTunes and Amazon. “Great American Song” is the first single off Acklen Park’s new record (Otter Rapids Music) due for release later in 2012. “Great American Song” will also be featured on an EP, along with two more songs, scheduled for release by April. The Nashville duo, comprised of Marcum Stewart from Huntington, WV and Andrea Villarreal from Chesapeake, VA, is working with producer/engineer Chris Utley. Stewart wrote the up-tempo anthem “Great American Song” with Nashville songwriters Bill DiLuigi and Shantell Ogden.